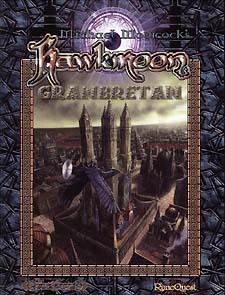 The Dark Empire of Granbretan reaches out to conquer the world! Within his life-sustaining Throne Globe, the immortal King Emperor Huon raises a withered hand and a million beast-masked warriors charge across the Silver Bridge. They desire to conquer the world, to enslave all humanity so that the mad Granbretanians can indulge in their twisted lusts or depraved hatreds. No army in Europe can stand against the flame-lances and foul sorceries of the Dark Empire. No force in all the world can staunch the wounds they inflict - save for the eldritch influence of the Runestaff! War is coming. Where will you make your stand against the Dark Empire?